It’s hard not to notice the influence of the oil and coal industries at the North Dakota Heritage Center in Bismarck. Inside the Continental Resources-sponsored Inspiration Gallery you can learn about coal reclamation, touch the Bakken shale, and guess which everyday products are made of petroleum. You can buy oil-themed chocolate at the gift store. Fossil fuel companies are some of the largest donors to this museum, which reopened in 2014 after a $52 million expansion and renovation. That’s why a traveling Smithsonian exhibit called Green Revolution that talked about climate change and renewable energy seemed like an odd fit. In fact, it was closed just four months after it opened, and just over a week after a series of complaints from the oil and coal industry groups that helped the museum expand. I went down to the museum the day after the exhibit closed and asked to see Green Revolution. An elderly woman volunteer behind the museum’s front desk sighed and said, “Oh boy.” She summoned a museum employee who told me the exhibit was closed and was being enhanced. When I asked why, she read from a piece of paper taped to the desk. She called the museum’s communications director, Kimberly Jondahl, down to explain further, and we walked over to the exhibit. The door was locked and there was a black curtain drawn across it. Jondahl said the plan was to add more about local sustainability efforts in North Dakota and reopen the exhibit. 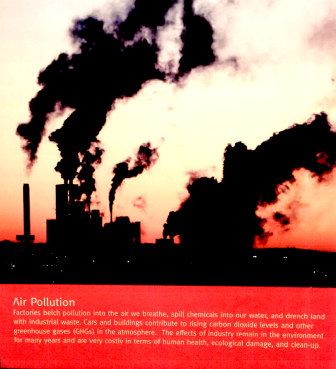 A photo included in the email complaint from the North Dakota Petroleum Council shows a panel from the Green Revolution exhibit. 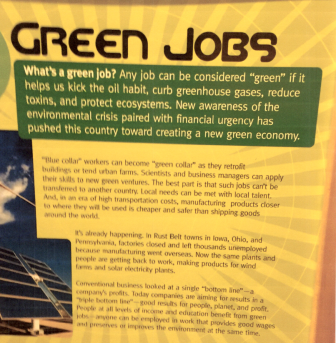 The exhibit includes panels that talk about green jobs, wind energy and recycling. There are phrases like “kick the oil habit,” “factories belch pollution” and “expensive, polluting fossil fuels.” Yet Jondahl said they had not received pushback from oil or coal companies. But what about to alter the exhibit somehow? Tessa Sandstrom, communications director for the North Dakota Petroleum Council, said she heard from a friend who works in the oil industry who was unhappy with the exhibit. He sent her some pictures of offending panels. Without going to visit herself, she complained to her boss, Ron Ness, that the exhibit wasn’t objective. That same week, David Straley, a spokesman for North American Coal – which has donated a quarter million dollars to the museum – complained the exhibit, “throws coal and fossil fuels under the bus” and said it may cause “some internal heartburn (hopefully not more)” from the company. And there was. On March 2, two days after receiving Ness’ email, Claudia Berg, director of the State Historical Society of North Dakota, which runs the Heritage Center, had sent out an email scheduling a meeting for the following Tuesday to assess the exhibit in light of recent complaints. On the following Tuesday, March 8, Berg made the call to close the exhibit. Berg says she had concerns about Green Revolution from day one. She thought it was “lacking enthusiasm” and that visitors and volunteers complained it was boring. Berg plans to reopen Green Revolution after adding more about sustainability efforts in North Dakota. They have asked the same oil and coal industry groups that complained about the exhibit for more information on how they have become more green. Berg says it is appropriate to ask them, because she lacks that expertise. The Heritage Center is accredited by the American Alliance of Museums, whose donor ethics standards state that museums must maintain control over the content and integrity of their exhibits. According to Berg, they have not violated this standard. “As a museum we are trusted for the information we provide our visitors, and we take that very seriously,” she said. For Beka Economopolous, who directs the Natural History Museum in Brooklyn, the real threat isn’t outright pressure from industry to influence exhibitions, but rather self-censorship. She claims this is a national problem. Indeed, in 2012, the University of Wyoming removed a climate change-themed sculpture a year early after facing pressure from the fossil fuel industry and legislators – making national headlines. That’s why Economopolous released a letter last March signed by nearly 150 scientists that called upon science and natural history museums to cut ties with fossil fuels (since then, David Koch, who made some of his billions in oil and coal, has stepped down from the board of the American Museum of Natural History in New York and the California Academy of Sciences has said it is divesting from fossil fuels). Otherwise, it’s difficult to avoid what she calls “museum capture,” when a museum’s oil and gas company sponsors exert pressure to modify exhibits that then serve to naturalize and promote industry perspectives on energy. He supports the idea of adding the “North Dakota story” – as long as the Heritage Center doesn’t change any of Smithsonian’s original content. 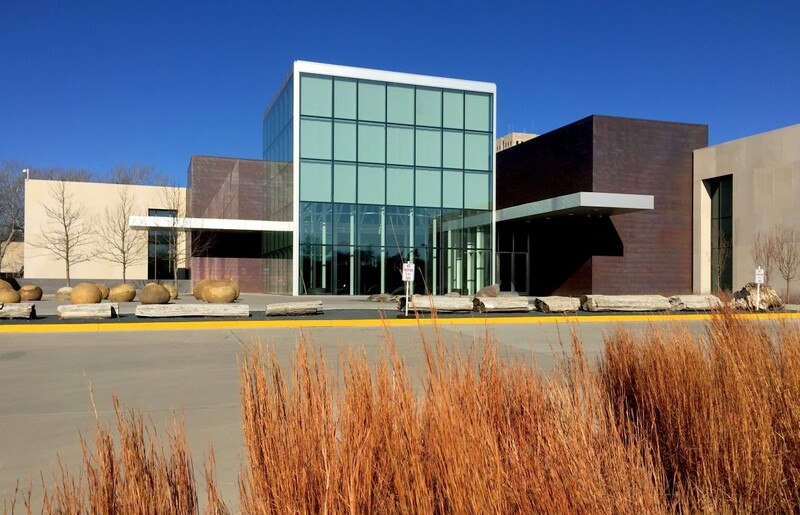 Note: Prairie Public Radio, a member of Inside Energy, co-produces Dakota Datebook with the State Historical Society of North Dakota, which operates the Heritage Center. 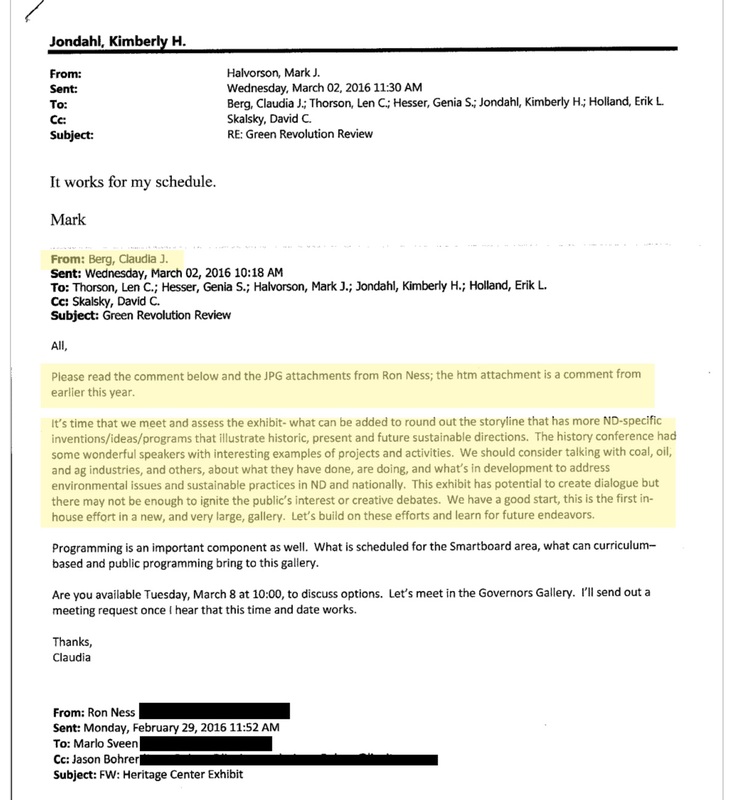 Read the emails we received as part of our open records request on DocumentCloud. Learn more about the national call to encourage science and natural history museums to divest from fossil fuels. Read more about the University of Wyoming’s controversy over a climate change-themed sculpture in 2012.